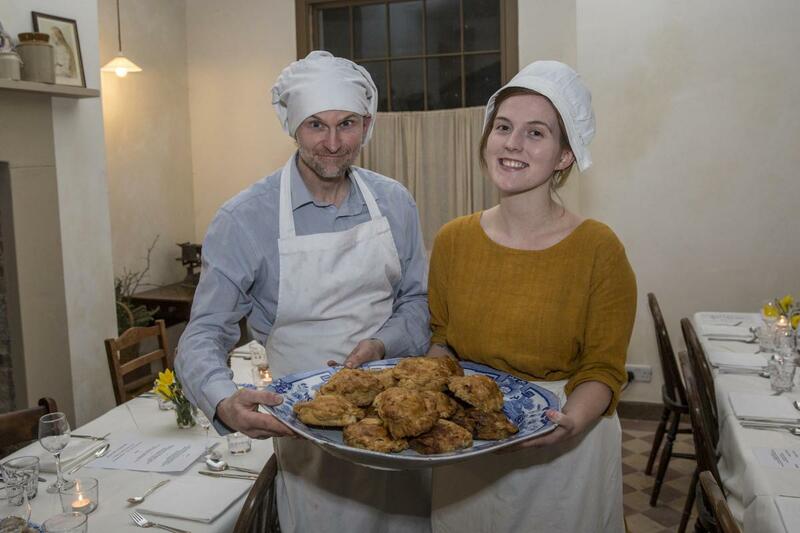 There is a restoration project in Hove, UK where guests are invited to a fundraising dinner where they will Dine Like Servants. In February 2018 we were even featured in the local newspaper, the Argus. It’s at the Regency Town House in Brunswick Square, Hove. Hove is part of Brighton and Hove. Brighton and Hove are on the South coast of England. Did Servants dine? What does that even mean? The starting point for me was producing food that would have been made in the kitchen, been sent to the high tables of the dining room and worked it’s way back to the kitchen when it wasn’t eaten. The elaborate food that was created for the super-rich upstairs was rarely completely eaten. There were always leftovers. Food was another status symbol and much of the food was not eaten. When the food made its way back downstairs the higher ranking servants, the butler, housekeeper and cook, were the first to choose what they wanted to eat. The food would then work its way down the servant social hierarchy. Eventually any food that was left over would leave the house and be taken to the local poor. At the Regency Town House the poor were very close. Behind the Town House is Brunswick Street East, which houses the Town House’s old stables and that street would of be full of small businesses with many people rarely having enough to eat. What the inhabitants of those working class streets didn’t eat would be fed to animals, again often only a few metres away from where the food was first created. There were horses and donkeys behind Brunswick Square. One of the streets is still called Donkey Mews! I cook, with the support of other volunteers, in the old scullery. We have just recently (March 2018) installed a sink, in it’s original place. Before the sink was installed I, and the other volunteers, would carry large buckets of water up and down the stairs. Perhaps taking authenticity rather too far?